Professional development while abroad (#ProfDevAbroad) is the idea that you can use your time abroad (like a gap year, career break, study abroad, teach abroad, etc. ), no matter how short or long, to launch and grow your career no matter what your field. We’ve all learned about the benefits of global experiences, so why not maximize your next travel adventure to build upon one of the 4 Pillars. With this workbook, you will identify your career goals, choose (at least) one pillar (strategy) to focus on and learn how to incorporate that pillar into your next global adventure. So you’ve just come back from a transformative global experience. All you want to do is start your next adventure…but where? At home? Abroad again? How do you decide what your next best move is? I’ve been there before. Feeling depressed, unsure, confused, overwhemled…all these feelings and more can explain how one feels after returning home from a transformational experience. I’ve returned home half a dozen times and each time I get the urge to just go abroad again. But that wasn’t always the best option for me, despite how I felt. Through careful reflection and the right coaching, I have learned to make more informed, precise and useful plans for my post-abroad life (which sometimes included going abroad again!). My friend and fellow global living enthusiast, Cate and I have had many conversations about how we’ve decided what to do next at different times in our lives – what worked and what didn’t. We saw a lot of global adventurers making the same mistakes we did, so we created a short workbook that takes you through the strategy we use when we’re in re-entry. 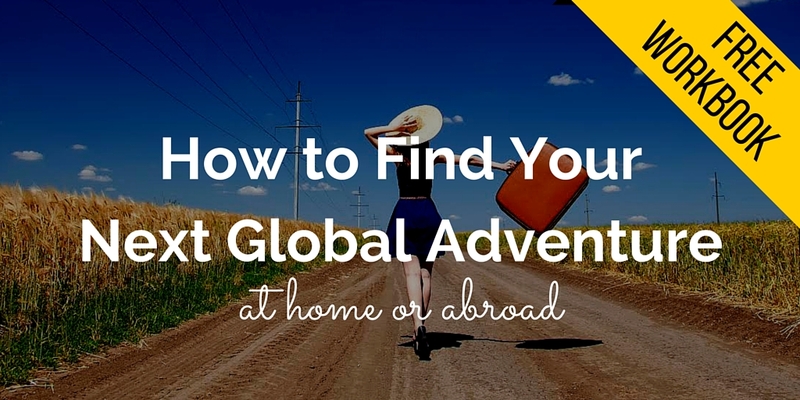 This workbook is a simple tool for deciding whether your next step is to go abroad again or create a global life at home. Want to earn your master’s degree abroad? Europe is a great desitnation with quality universities in beautiful cities offering hundres of programs taught completely in English. If you’re interested, this book will help you decide if getting your degree in Europe is the best fit for you. And if so, it’ll give you the lay of the land on how to go about applying. Is going to grad school in Europe the right choice for me? How will a degree from Europe advance my career? What will it be like to be an international student in Europe? Where do I start my search for a program? How do I manage the application process and prepare the best application materials possible? Download this FREE step-by-step Grad School in Europe guide here.